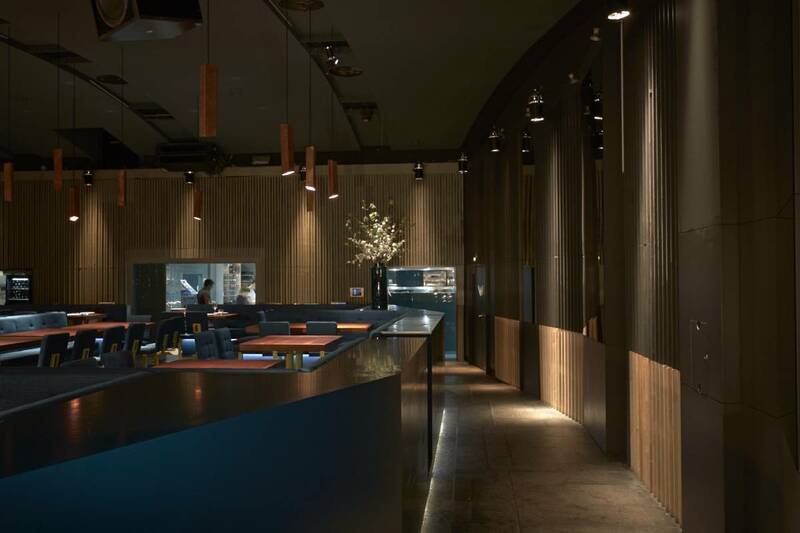 Laura V Rave and Jörg Schumann designed the acclaimed transformation of the former Cookies night club in Berlin into the Crackers restaurant. Passing through a brightly lit yellow corridor at arrival, one walks through the restaurant’s light-blue colored open kitchen before entering the former club’s dance floor. Surrounded by light and dark walls, and mirrored surfaces, a petrol-colored open-platform for dinning is raised in the centre of the space below an arched ceiling with golden-hued chandeliers. All further details are kept in light blue, neon yellow, and mahogany wood. The raised dinning platform opens up to a bar area at the back of the space.